ANNOUNCEMENT! We're moving! Starting in JULY we'll be meeting at our new location at The Barn in Mariemont. The Barn is located at 6980 Cambridge Avenue, Mariemont, OH 45227. We've greatly appreciated our time at the St. Clare Convent, but felt at this time it was best for us to try something new - a more modern space with an artsy feel and better lighting. And! They have a design wall! Member Q&A Round table: What is the current hot project you want to do when you have time, or at least fantasize about doing when you have time, or the project you squeeze in time for? Yo usually works with a dark palette but would love to work with neutrals and pastels. 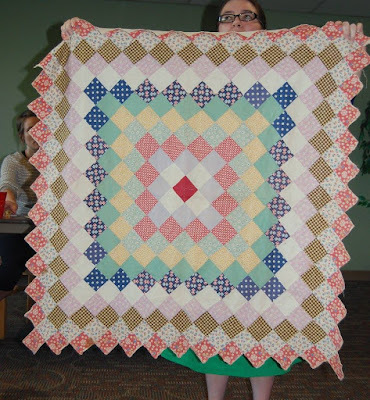 Annie is enjoying summer and doesn't have a project on her table right now, but she just finished two t-shirt quilts - she was asked to make a quilt for a graduation present for a young man who's father passed away, using his old shirts. 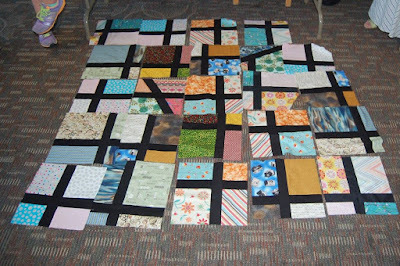 She also made a baby quilt for him to use later down the road. Abby wants to make a Gingham Tote, an Anna Graham pattern. Susan wants to dive in to patterns by Australian designer Jen Kingwell. 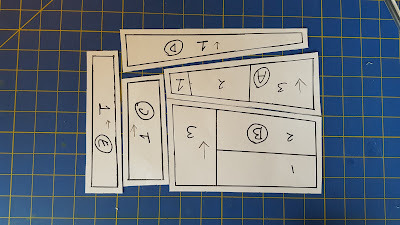 Amy cleaned up her sewing area and found her bee blocks and will get started working on those soon. Dorothy's hot project that she just finished was her "57" quilt - see more details below in the Show & Tell section. We welcomed back Nancy to the guild - she was busy earning a degree but now she's ready to get back to quilting! One thing she plans on finishing soon is her Betsy Bag. Christine has a million projects that she's working on. Kay said she definitely does not need to fantasize about any new projects since she has 12 unfinished projects to complete. Holly, too, is finishing up a bunch of projects. Ellen #1 has a couple of do.Good Stitches quilts to finish. 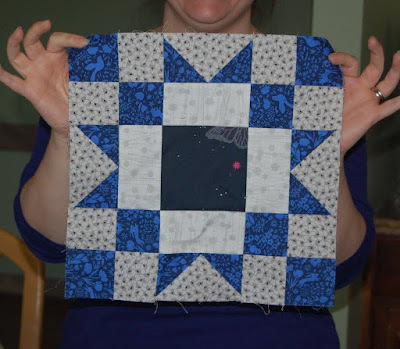 Tara finished a spinning stars quilt and wants to make Lori Holt's farmer's quilt. 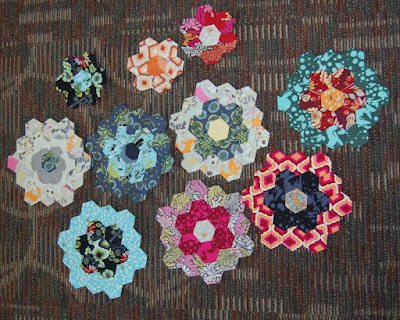 Rachel has some improv ideas and wants to start a LaPassacaglia EPP quilt. 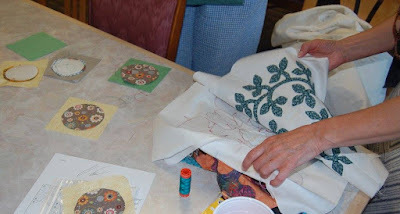 Wendy's hot project is her LaPassacaglia quilt which will most likely take her an eternity to finish. Janine doesn't have any hot burning projects because she has 16,000 unfinished projects. 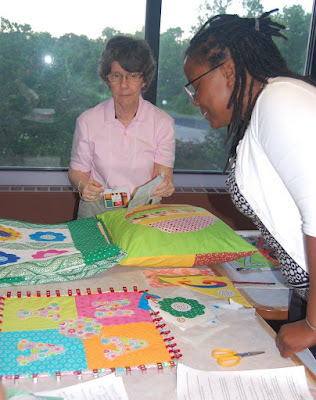 Ellen #2, like Rachel, wants to start a LaPassacaglia quilt! 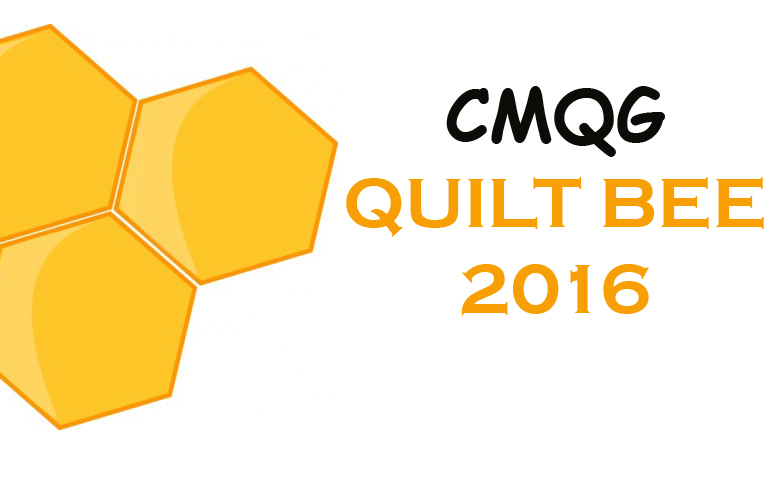 QuiltCon East 2017 registration begins June 25, 2016. 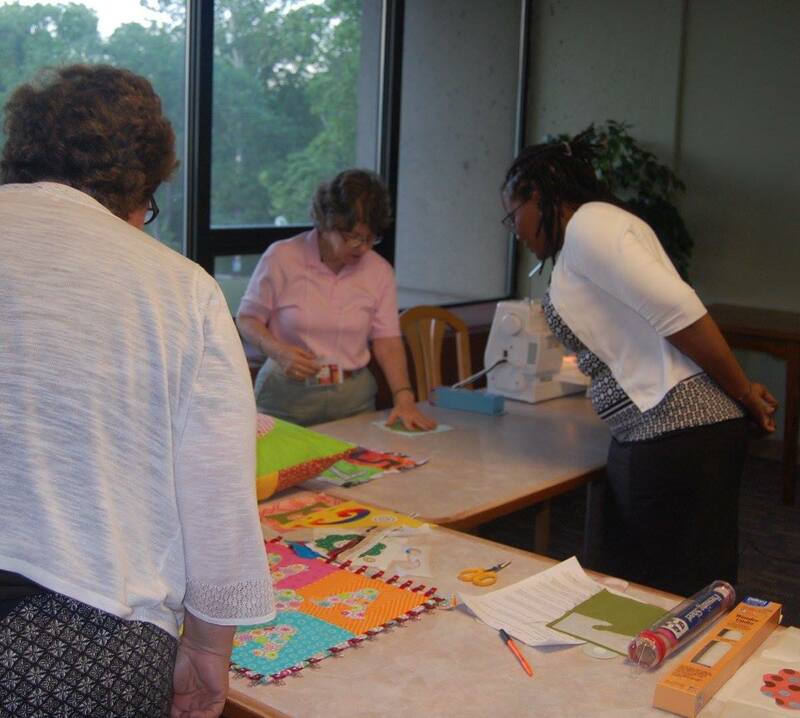 QuiltCon is presented by the National Modern Quilt Guild. (If you're a paid member of our local guild you are also a member of the national guild.) 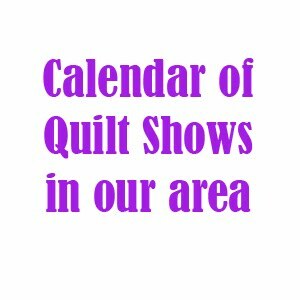 QuiltCon 2017 takes place in Georgia February 23-26, 2017. If you're interested in helping with the QuiltCon charity quilt - let Ellen #1 know. The final design has been chosen (a modified Ohio star) and the fabric has been purchased. 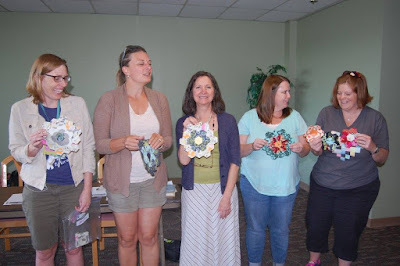 The group will get together Monday, June 13 from 5-8:45 p.m. at the Madeira Library to cut up and split the fabric and block construction can begin. We've decided to revamp our existing logo and we want your help! Using THIS TEMPLATE paper piece your own logo block, using whatever colors you'd like. The only rule is that you have to use solid colors, and they do not have to be Kona, just any solid colors. Bring your logo to the AUGUST meeting. We'll decide on the winner and then we'll use all of the blocks to create an "Opportunity Quilt" which we'll raffle off. 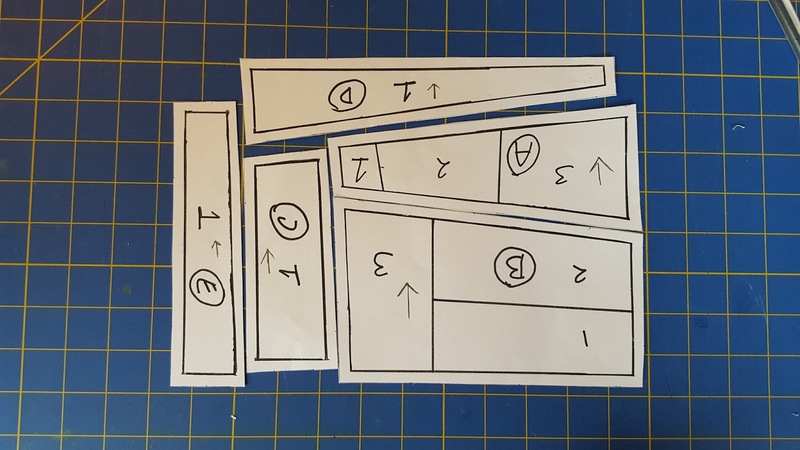 UPDATE: If you get stuck on assembling the paper pieces check out this photo for help. Also, notice that the date was moved to AUGUST to allow for more participation! And you can make more than one! Shonna received her slice and insert blocks! Becky wants her hive members to make her this block from Wanta Fanta - click here for all of the details. 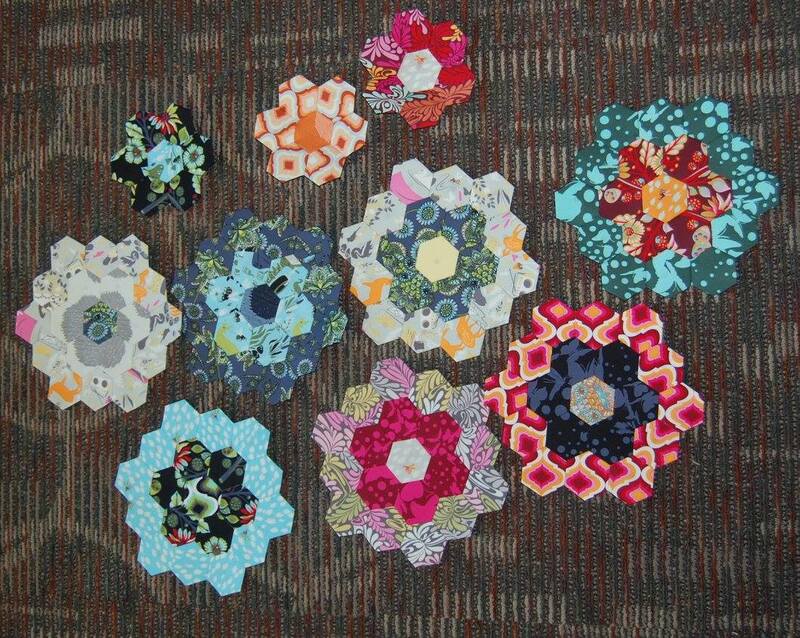 Janine asked her hive members to make her two blocks from the Picnic Quilt pattern - click here for all of the details. 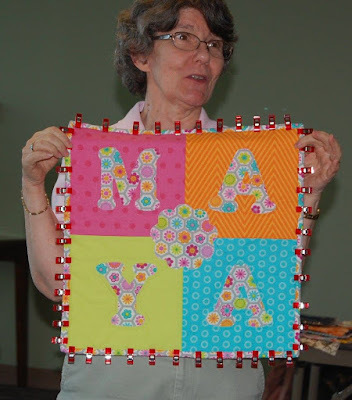 Carol showed her "Maya" name mini quilt wall hanging. 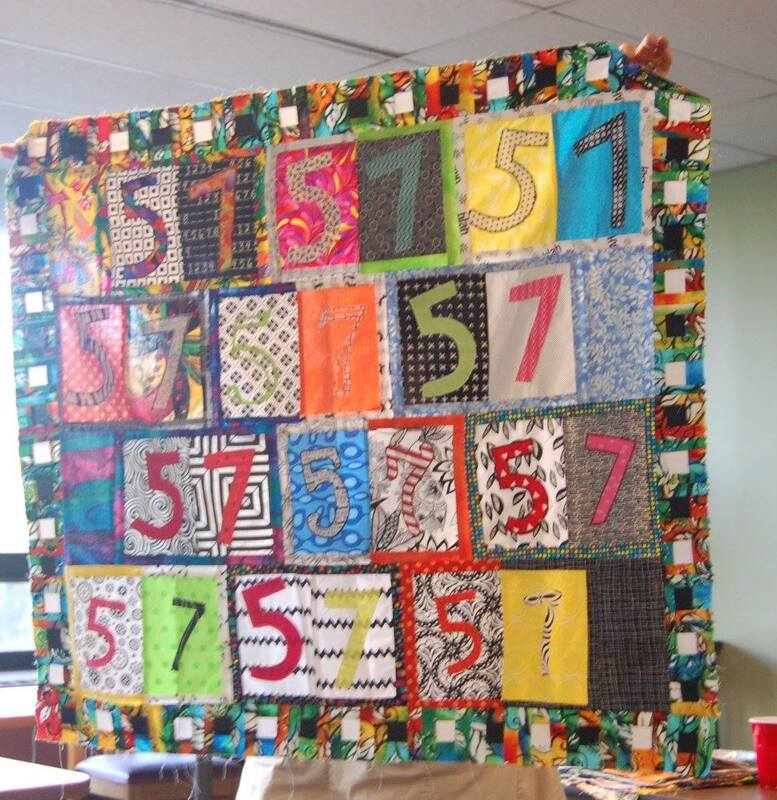 Dorothy finished the top to her "57" quilt. Rachel made a block! This is her first block ever. 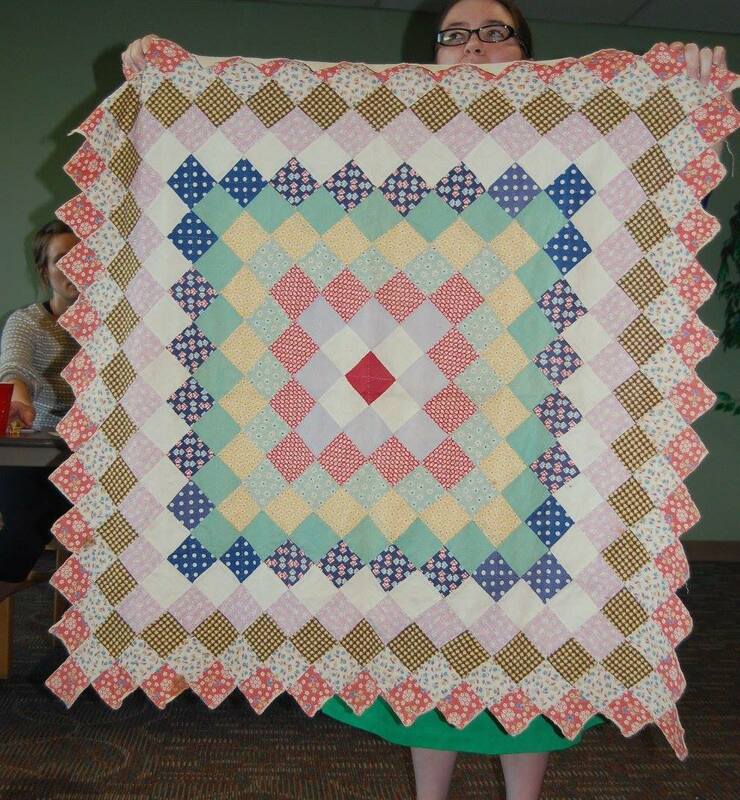 Rachel showed this beautiful vintage quilt that she found in her house. ALSO! Rachel shared that her Improv Quilt, which one BEST IN SHOW for our Improv Challenge, will be featured on QNN's Quilt Monkey show sometime in the future! Way to go Rachel! 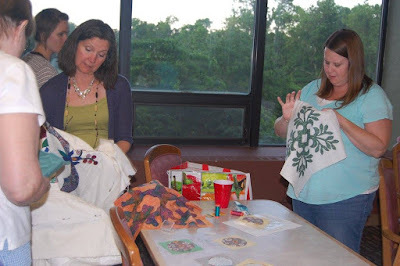 Carol taught us how to do raw edge applique. Janine taught us how to do needle-turn applique. If you are going 1-71 North or 1-71 South exit on Redbank Road. Follow the road. The first stop light is Duck Creek Road. Proceed through the stop light and go to the second stop light. This is Madison Road. There are two left hand turn lanes and you will be turning LEFT onto Madison Road. Go on Madison for maybe a mile and a half. The road ends at Camargo/Plainville Road. You will be turning RIGHT onto Plainville Road. Go about one mile ... and you will make a left hand turn onto Cambridge Avenue. (There is a auto repair shop at the corner of Cambridge and Plainville Road) It is a residential street. Go straight on Plainville to the end of the street, and 6980 will be on your left, a big white barn. There is parking on the west side of the building, the front, and circular drive, and on street as well. If you are coming from Route 50 go Route 50 East through Fairfax, and into Mariemont. As you approach downtown Mariemont PLainville ROad will be on your left at the corner of Wooster Pike (US 50) and Plainville where the elementary school is. Turn Left on Plainville Road. Go straight and Cambridge Avenue will be on your right. Turn RIGHT and follow Cambridge Avenue to 6980 Cambridge. If you are on 1-75 South, go 562 Eastbound (the lateral) to I-71 North to Redbank Road and follow the directions above.